The Germans know a thing or two about building big guns. Incredibly, while this self-governing Howitzer is only a fraction the size of the Gustav of WWII, it's just as deadly—with the ability to strike targets up to 30 miles away. Don't bother running. 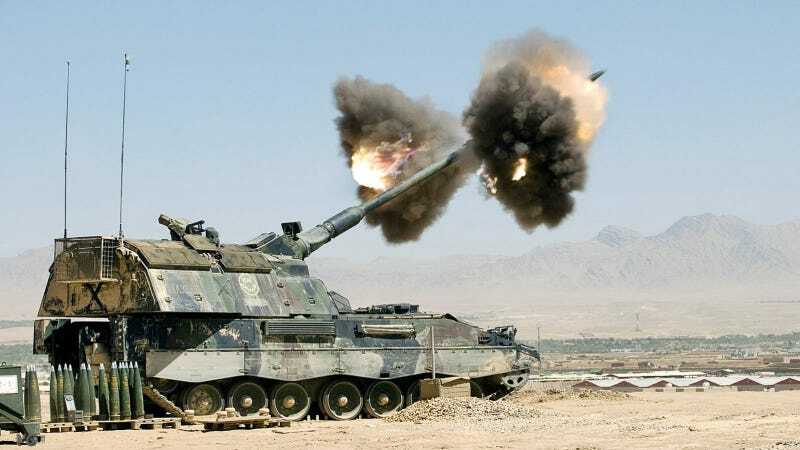 The Panzerhaubitze 2000 (or just PzH 2000) is a 155mm self-propelled howitzer developed by Krauss-Maffei Wegmann (KMW) for the German army to replace its quickly aging fleet of M109A6 Howitzers developed in the 1950s and '60s. This 55-ton behemoth is powered by an eight-cylinder direct-injection, supercharged diesel engine. This thing does not mess around. One of the most powerful conventional weapons on the modern battlefield, the $4.5 million PzH 2000 can unload three 155mm artillery shells in just nine seconds, ten rounds in 56 seconds, and maintain a steady 10-13 round/minute fire rate as long as the barrel holds. The 52 caliber barrel, by the way, measures 26 feet long and is plated with chromium to keep it from failing under the massive heat stress exerted by shooting off all those rounds.